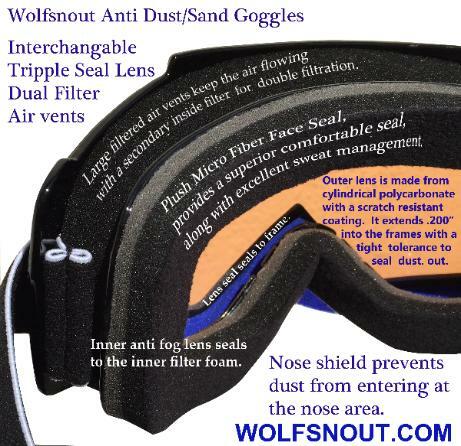 Check out the Wolfsnout*® Dust mask and goggle set up. For the off road lifer that only feels at home in a MX helmet and goggles, but hates all of the dust. Nothing beats the Wolfsnout set up! Spring has Sprung here in Georgia, It is headed your way! Time to start thinking about riding again! Take a look at all of our accessories! Spring is already here in GA. Beat the rush! Enjoy your extra hour of daylight riding, with our full line of products. Due to the popularity of this product, the GROUND FORCE CARBON goggles are temporarily sold out. They are the best anti dust goggle on the market because we filter the lens with a triple filter system. If you don’t mind a short wait we will temporarily be selling them to you at a DEEP DISCOUNT that you will never see when they are in stock. We do make some of the components here and some are supplied from sub contractor’s. We are waiting on parts to arrive and expect to receive them April 15. +-5days. We will be assembling them on a first ordered first serve basis when they arrive. All Dust masks are available now. Tim Wilcox, founder of Wolfsnout LLC could not find an acceptable mask for riding the tracks and trails when dusty. No mask could meet the requirements of working well with a helmet and goggles, while not being to hot and hard to breathe through at a fast paced breath. So he cut a new trail. One that began with function first, to let form and fellow riders follow. One just for us, the best Motocross, ATV, UTV, Dirt bike, dust mask on the market. See our full line of dust fighting products!